"These hushed woods once echoed with the rumble of wagons chock full of gold ore. Teamsters urged horses down muddy streets. Mine hoists clanged. Whistles blew. 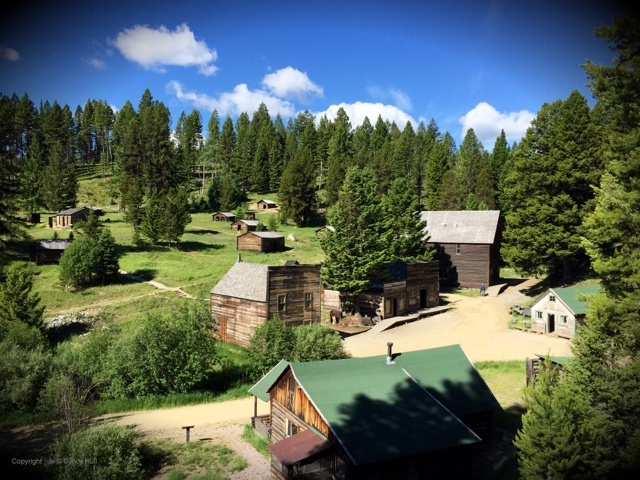 Children raced to school..."
Monday - delightfully, a holiday - dawned bright and dry, with a precocious wind wafting lazy clouds across the wide Montana sky: a perfect day to meander about Garnet Ghost Town, an hour northeast of Missoula, Montana. Garnet's historical landscape proved appropriately thought-provoking for a day set aside to remember hard-won freedom, including the freedom to create and benefit from our own opportunity. Each building whispered its own stories of hopeful small-town families who worked diligently toward making their own big strike. To continue the earlier quote, from an on-site interpretive kiosk and Garnet's website: "...In January of 1898, some 1,000 people knew Garnet as home...There were four stores, four hotels, three livery stables, two barber shops, a union hall, a school with 41 students, a butcher shop, a candy shop, a doctor's office, an assay office, and thirteen saloons... By 1905, only 150 [people] remained..."
Despite all the sweat equity and optimism invested, the wealth to be mined from Garnet's surrounding hills was finite, and the town's residents moved on to the next season of their history. Truth be told, the freedom we live under does not promise that our best efforts will yield wealth and success, that giving our hearts will lead to true love and happily-ever-after, that eating right and exercising enough will ensure a long and healthy life; need I go on? But the self-evident truth still exists that we are endowed by our Creator with certain unalienable rights that include those of life, liberty, and the pursuit of happiness. So I choose to be fully present in this now, knowing my future is ultimately held in the faithful hands of One far stronger and wiser than I am. And somewhere in that Pollyanna-ish simplicity resides a lot of peaceful liberty, and an honestly happy life. You just never know what you'll come away with when you visit a Montana ghost town, especially on the Fourth of July.